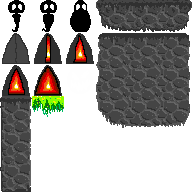 The 32x32 spritesheet used in my Ludum Dare 40 entry, so as per usual I'm giving back to OGA for being an awesome resource. The cobblestone platforms are probably the most generically useful thing here. As with my other contributions, I am putting this up in the most permissible licence I can thats not PD; if you use this for any game project, or use these as the basis for any edits of your own, you do not have to credit me, but it would be nice to let me know by dropping a comment below. If you are using these as an asset, or as part of an asset compilation for resale or redistribution, you must state that it was obtained for free, and provide a link to its OGA page.